The fact that so many rage cases line up in support of abortion on demand could be a clue that your priorities need a rethink. What he did was caught on video, went viral, and cost that cowardly thug his job. Now that it’s 2019, we’ve got another violent defender of abortion. Founder of Abortion Clinic Live, Ryan Roberts was pleading for the lives of the unborn outside an abortion clinic in Fort Worth. He had a wonderful conversation with a young lady who decided to keep her baby, and who prayed with him. His day changed direction when this guy with a truck threatened to kill him and his whole family. When told ‘Jesus loves you’ he parked his truck, got out and smashed Pastor Dickson in the face a couple of times, leaving him a bloody mess. Nevertheless — as the saying goes — he persisted. He shook it off and kept at it when someone else came along. As a man entered the clinic, Roberts begged him to not abort a baby. “I don’t blame him,” the man responded. 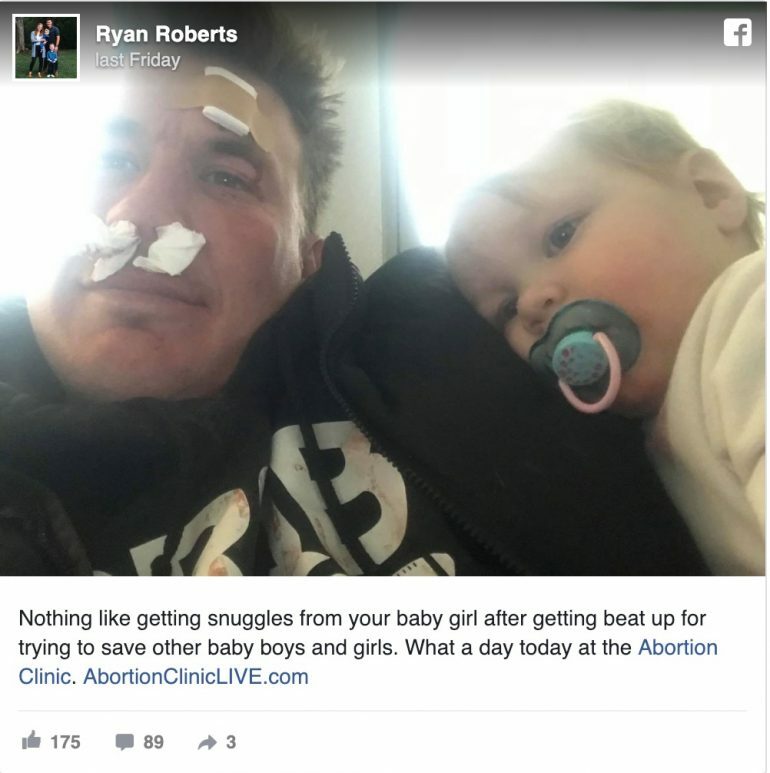 Roberts, who is a football coach, said he has been going to the clinic five to six times a week since June when he found out his parents intended to abort him. …In an interview with The Daily Wire, Roberts said that the man was quickly identified by police but not arrested and that an investigator is on the case. Roberts added that he believed the man was on drugs and was also told the man was recently released from a mental hospital. Ryan — now that he knows how close he came to dying at the hand of an ‘abortion provider’ — is compelled to fight for the survival of others like him, long before they can even comprehend the danger they face. What reward does he get for his troubles? He’s been invited to the baby shower of one girl whose life he successfully intervened to save. Two nurses have quit, and they’ve installed soundproof windows on the building. That sure beats getting a new high score on some dumb video game, doesn’t it? As for the ghouls on social media who cheered the violence because they don’t like Ryan’s cause? Think long and hard about who you just aligned yourself with.